Despite falling 49-28 to the Dayton Flyers, the Robert Morris Colonials put up their best offensive performance in almost five years led by three touchdowns from quarterback Jimmy Walker. While it was not the result that the Colonials wanted, there was a lot to be happy about to open the 2018 season for Robert Morris. After a 44-yard run from Dayton’s Tucker Yinger on the first drive of the game, the Colonials responded right back, going 72 yards in seven plays and capping it off with a 15-yard touchdown catch from Matthew Gonzalez. 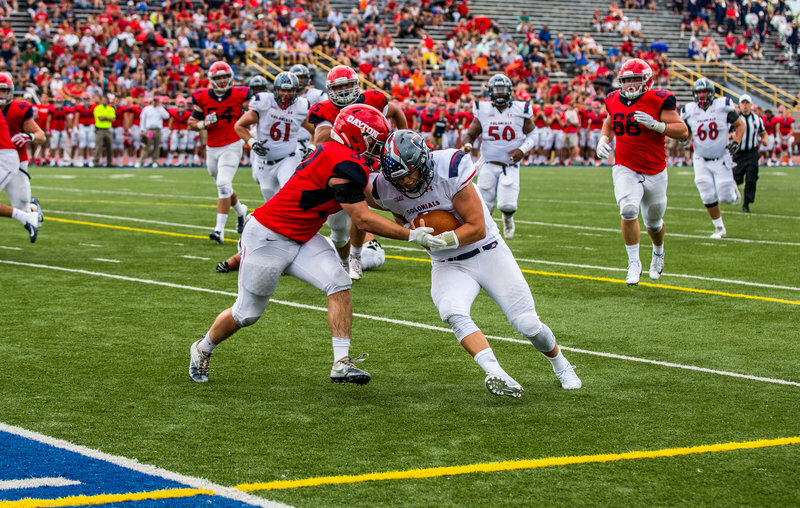 Once the game was tied 7-7, Dayton scored three straight unanswered touchdowns, including a 31-yard Adam Trautman touchdown reception and a 64-yard Ryan Skibinski touchdown run off a bubble screen. It seemed as though while the RMU offense seemed to find its footing well, but on the defensive end of the ball, stops were coming few and far between each other. The Colonials defense failed to force a single turnover and only made Dayton punt the ball once in the entire game. The only other drives Dayton went without a score were kneel downs to end the first half and fourth quarter and a missed field goal from the Flyers. Additionally, the Colonials only had four tackles for loss and did not record a single sack. But the RMU offense did make a push at the end of the half to keep the score at 28-14 going into the half thanks to a 4-yard touchdown grab from Chase Bodeman. Bodeman, a former quarterback turned wide receiver, was another pleasant surprise for the Colonials as he picked up 51 yards receiving on six catches for the day. Both teams traded touchdowns to start the first half to make it 35-21 as the Colonials would force the Flyers to punt for the only time in the game. It appeared that RMU was going to have a chance to get the game within one score with still an entire quarter left to play. But while Flyers punter Sean Smith only had one punt in the game, he certainly made it count. Smith booted the ball 50 yards to pin the Colonials at their own 1-yard line to start their drive. A drive which was destined to fail solely based on ball location quickly sent the ball back to Dayton. The Flyers started to put themselves out of reach with a 3-yard run from Richie Warfield to make the score 42-21 with 30 seconds left in the third quarter. Unable to sustain any sort of truly meaningful drive, the Colonials fell behind 49-21 and head coach Bernard Clark made the decision to rest starter Jimmy Walker, who finished the day 16-for-32 with 219 yards passing, two touchdowns and an interception. In to replace Walker was redshirt freshman George Martin, who led a scoring drive of his own, finishing with a 6-yard touchdown pass to 2017 offensive MVP Tim Vecchio, who recorded his first score of the season. With just 22 seconds left, the Colonials attempted an onside kick which would bounce harmlessly out of bounds for the Flyers, who would walk away avenging their 13-10 upset loss from last season. While it was not the statement game many hoped for in the first game for new head coach Bernard Clark, the team will have a chance to claim their first win of the season against the Virginia State Trojans in the RMU home opener next Saturday at Joe Walton Stadium.